Oh, Morocco! We were so thankful that we didn’t listen to all the articles we read about female travel in Morocco. We chose to have an open mind and an open heart before we entered this beautiful culture. Of course, it’s always a good idea to research and familiarize yourself with other traveller experiences, but, never take the experience of someone else and make it your own before setting foot in a country! We didn’t, and as a result Morocco became one of our favorite places. A Mecca of medinas, snake charmers and beautiful carpets (no Aladdins, though). The highlight for us was simply wandering through all the passageways and admiring all the Moroccan artifacts for sale. Beautiful carpets! We were also careful with covering our shoulders and knees to show respect. Vendors will try to get you to come into their shop or take you to their family member’s shop, you just have to politely decline or say you have to be somewhere and that you will come back later. Be respectful with your photo taking, some vendors don’t like to be photographed and do not appreciate their shops/ goods being photographed. Some expect money for a photograph, like the snake charmer who demanded we give him $20! A jeweler we stopped to talk to was more relaxed, though, and when I asked him if we could take a photo he kindly obliged. 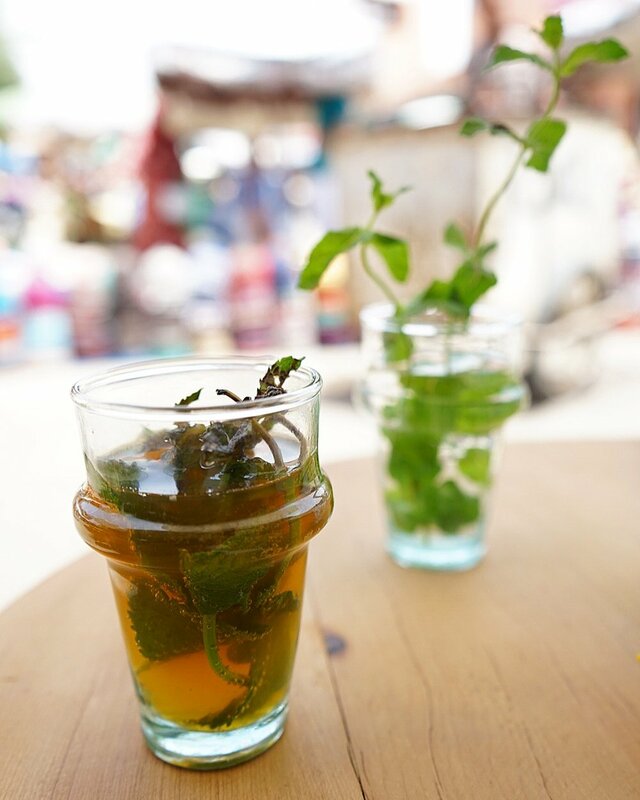 Mint tea is served everywhere and is amazing; always served with a handful of fresh mint leaves. Finding vegan options was fairly easy, too. The local dish, tagine, is served everywhere and is pretty customizable.